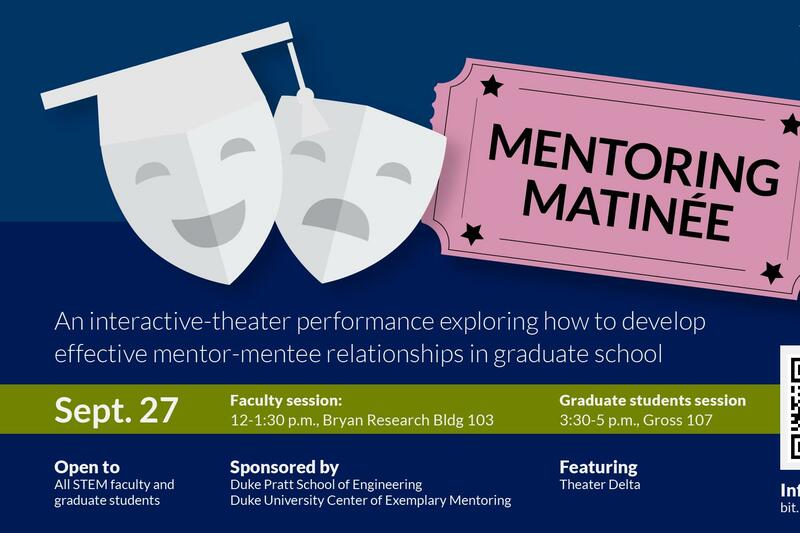 Effective mentor-mentee relationships are crucial to success in graduate studies. "Mentoring Matinée" will tackle common issues that can undermine those relationships, including giving and receiving critical feedback, setting expectations, mentoring across cultural differences, and more. An interactive-theater group (Theater Delta) will perform scripted, realistic scenarios in which characters experience a series of conflicts. After each scenario the audience will have an opportunity to engage in a facilitated dialogue with the characters to further explore the themes presented. There will be two performances, one for faculty and staff and the other for graduate students. All STEM faculty and graduate students are invited. ¿	Performance for faculty and staff: 12-1:30 p.m. in Bryan Research Building, Room 103. Lunch will be served for registered attendees. ¿	Performance for graduate students: 3:30-5 p.m. in Gross 107. Light refreshments will be available. This event is eligible for Responsible Conduct of Research credit for Ph.D. students.